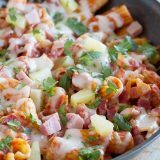 Keep dishes to a minimum with this easy one pan pasta with the flavors of a Hawaiian pizza – ham, bacon, pineapple and gooey cheese. My family loves food. Whenever we get together, it’s all about the food. I love it, because I think they are all amazing cooks, so our meals together are something not to be missed. I also love it because most of them are a lot like me – they love finding and trying new recipes. But while there are always a few new recipes on our holiday tables, for the most part, we like to stick to tradition. Meaning turkey on Thanksgiving and ham for Christmas. I won’t lie – I do like the Thanksgiving turkey, but I really look forward to that Christmas ham. I always count down the days until that Christmas ham. It was fun to come up with these new ham glaze recipes, but I do have to say – that was a lot of ham for my little family of 5. It’s a good thing we love ham. And it’s a good thing I was able to get creative with that leftover ham! So creative, in fact, that I have a whole slew of recipes now that are great for using up that leftover ham. 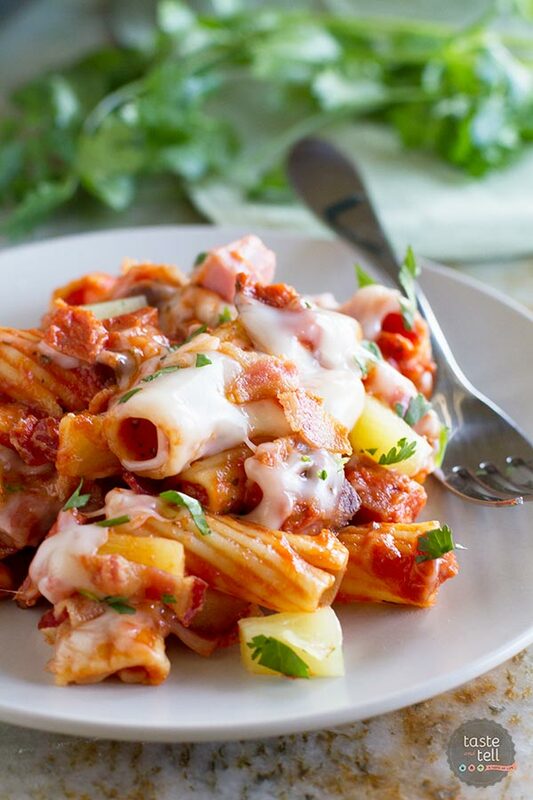 And today, I’m already getting you excited for those Christmas ham leftovers with this Hawaiian One Pan Pasta. 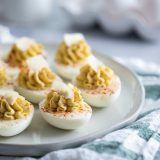 When I am planning my weekly dinner menu, there are a few things that I look for. Recipes that don’t have a lot of ingredients, don’t have a lot of steps, and are fairly straightforward and easy. And fast. This recipe has all of those covered. First of all, and maybe most important – only one pan!! Ever since I posted my Skillet Pasta with Sausage, I’ve kind of been obsessed with the whole one pan pasta idea. I mean, why boil your pasta separately and get another pan dirty when you don’t have to? Plus, I love that the pasta is cooked in something besides water (tomato sauce and chicken broth in this instance) because it gives the pasta so much flavor. Plus, it’s all done in 30 minutes! One pan + 30 minutes = win! Hawaiian pizza is one of our favorite pizza flavors, so I couldn’t resist giving this a Hawaiian pizza twist. Not only do I use that leftover Jones Dairy Farm Ham, but I throw in some of my favorite bacon from Jones Dairy Farm, because everything is better with bacon. A little bit of sweet from the pineapple, and melty mozzarella cheese on top puts this one pan pasta as one of my very favorites. We seriously loved this so much that I made it twice in one week! And happy day! If you are looking to order your Christmas ham, you can get 20% off your online ham purchase from Jones Dairy Farm from now until December 31st. But you need to be quick – for guaranteed delivery by Christmas, you have to order by the December 17th. 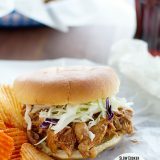 Just head to http://www.jonesdairyfarm.com/shopping and use the promo code JONES20 to get your discount. And I’m telling you – Jones Dairy Farm has my favorite hams, hands down. And you want the best for Christmas! Dice the bacon into small pieces. Heat a large skillet over medium heat and add the bacon. Cook until crisp. Remove the bacon with a slotted spoon to a paper towel lined plate to drain. Discard all but 1 tablespoon of the bacon grease. Add the cubed ham to the skillet. Cook, stirring frequently, until the ham is browned. Add the tomato sauce, chicken broth, onion powder, basil, and pepper to the ham. Stir to combine, then add the pasta and stir again. Bring the mixture to a boil, then cover and cook until the pasta is tender, about 15 minutes. (I like to stir this one or two times during the cook time to make sure all of the pasta gets cooked evenly.) Stir in the pineapple and reserved bacon, then remove from the heat. Sprinkle the top of the pasta with the mozzarella and cover again. 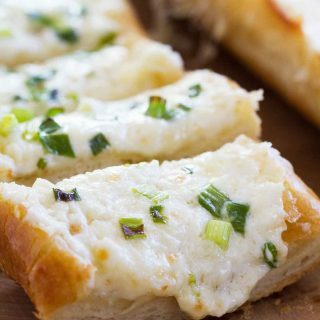 Let the dish sit until the mozzarella is melted. Sprinkle with cilantro before serving. A few people have commented that there was too much salt, so I have removed the salt from the recipe. Feel free to taste as you go and add salt to your preference. 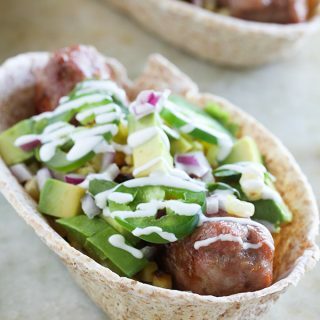 This is such a great recipe in so many ways. One pan? Leftover ham? Bacon? Pineapple? All that CHEESE? I love it. 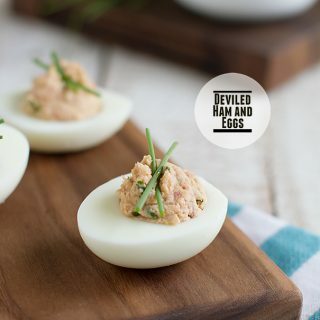 Such a great use for leftover ham! This sounds so good! 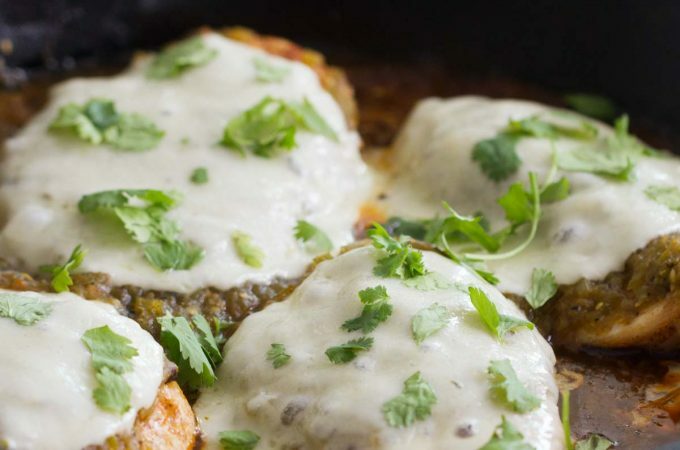 This is such a creative recipe and I totally adore one pan meal. Easy cleanup and yet taste delicious. My husband adores these flavors. I can’t wait to surprise him with this gorgeous dish! Pinned. This looks so incredible, I can’t stand it. Pinned. 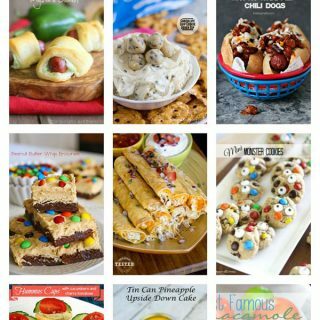 Oh my gosh, this is the most creative recipe I’ve seen in a long time! 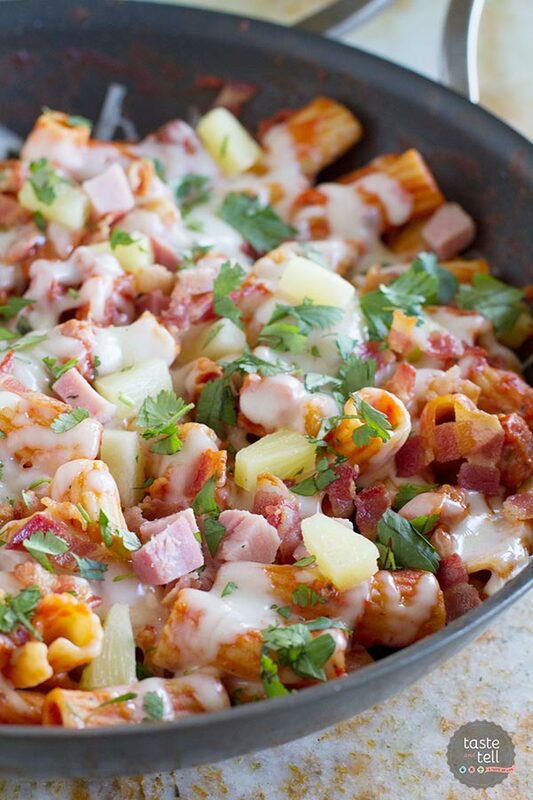 I’ve made loaded pizza-style pastas before, I would have never thought to do a Hawaiian pizza one. I can’t wait to try this! I love ham and pineapple pizza and I LOVE pasta. AND I’m always looking for creative ways to use leftover ham. This is amazing! By far the best use of leftover ham I’ve ever seen. Pinning! Oh my gosh does this ever look amazing! Josh showed me your pic off instagram last night and we were both drooling! This will be going on my menu soon. 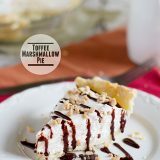 You have no idea how happy I am to find this recipe! My husband’s birthday is next week and he will go crazy for this! What a great way to use up leftover holiday ham! 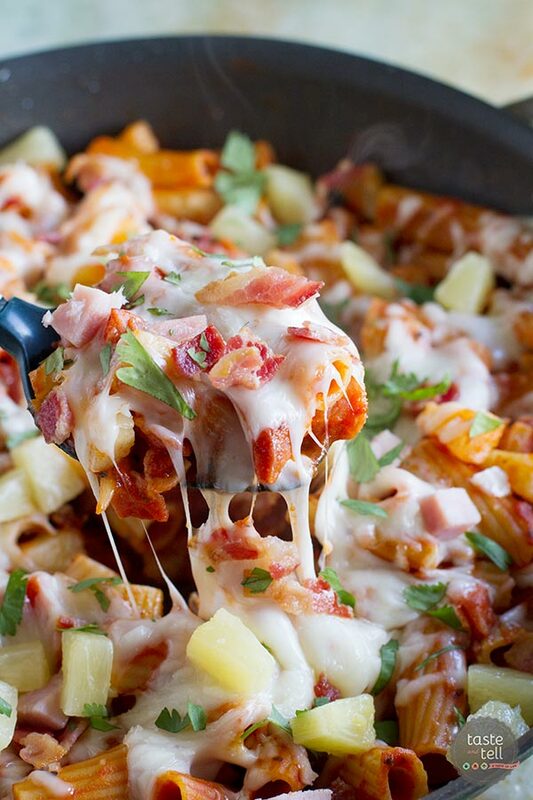 Hawaiian pizza is one of my favorite pizza flavors, so the fact that you turned it into a (one pot!) pasta makes my heart just a little giddy. Here’s to hoping we have leftover Christmas ham so I can make this one. This sounds absolutely delicious! I am definitely putting it at the top of my dinner list! I just made this. It was delicious. My only suggestion…leave out the bacon. The ham was more than enough meat and it was a little too salty for my taste. But I would totally make it again. I agree. I think this recipe would have been MUCH better with about half the salt. Otherwise, this meal was quite a hit and will be made again in the future. 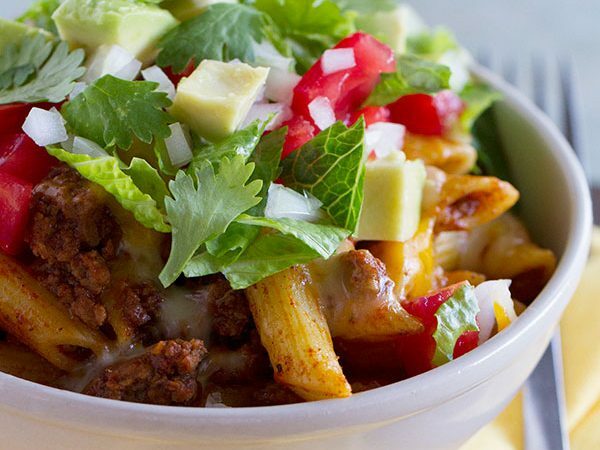 made this for dinner and loved the ease, one pot prep and flavor! Ha – I, too am totally ok with the house smelling like bacon!! I’m so glad you tried this and it worked out well for you!! I ‘m sorry, but my husband and I really did not like this. I made it exactly as is ,and I threw the rest of the pot. We like Hawaiian pizza , but the flavors in this just did not go together! I’m so sorry you didn’t like it! It’s been quite popular, but I totally understand that everyone has different tastes. Hopefully the next one will work out better for you! Is this some kind of joke? I added 2 cups chicken broth and then I had soup!! It doesn’t say when the pineapple. Thanks for wasting my time and money!!!! Hi Janet – sorry you had problems with the recipe. I just wanted to make sure you used dry pasta? The broth will get absorbed into the pasta, cooking it, so it shouldn’t be really liquidy. And the pineapple gets added at then end of step 2 along with the bacon. I’m really Sorry!! That is exactly what I did. I can”t believe I missed that step. Making this right now! Love the recipe and the current smell coming from my kitchen! Thanks so much! This was an awesome dish! Full of flavor. The only thing I did different was add a couple small diced peppers from the garden. This was awful! Followed the recipe to a T and came out tasting like crap. If you’re brave enough to make this then skip the salt. There is enough of it between the bacon and ham! Very good next time I would leave the salt out, it was salty enough with the ham and bacon. Thank you for the recipe. This looks great!! Any suggestions on what to serve with it? I would probably just pair it with a simple green salad. I don’t think it would need much more than that. Hope you love it! You probably could, but you’d need quite a large pan. My skillet is 12-inches, and it fills it up completely. You might be able to do it in a Dutch oven or something large like that, but the cooking time may change as well. I made this tonight for my family. It was OK, nobody was really fond of the flavors, I think it was the chicken broth that made it taste different for us. We mainly picked at the ham, bacon and pineapple lol. Very easy to make though and cleanup was faster! Wow! Made this dish tonight after I pinned it a couple weeks ago. I regret waiting that long! This was amazing! Definitely going to be a regular recipe. Thanks!! I pinned this years ago and it was good. I came across it again tonight, searching for dinner ideas. Except now I have an instant pot…. So making this an instant pot meal. I browned the bacon, set it aside, added the ham using the moisture from that to deglaze the pot. Added the pasta on top of the ham, sauce, spices and then chicken broth. I set the timer for half the time on the box minus one minute. I let it naturally release a couple minutes and added pineapple, bacon and cheese. It was perfect.